Vertical blinds are nowadays well known, but thanks to innovations upper profile, huge selection of materials (about 900 possibilities), many housing configurations and four slat widths (63, 89, 127 and 250 mm) are becoming increasingly popular. The indisputable advantage of vertical blinds is stepless transmission of light into the room. Upper running rail can be white, anodized aluminum or powder coated to any RAL color. Vertical blinds can be curved to any shape. Vertical blinds are an elegant alternative to curtains and drapes. 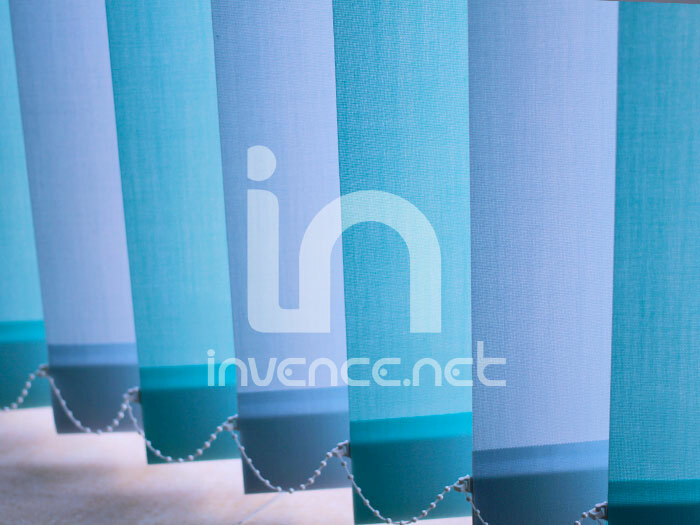 Fabric vertical blinds are tailor-made according to your requirements. Price of the vertical blinds depends on the dimensions (width, height), the chosen materials (wooden slats) and type of control (manual, 230 V). Fabric vertical blinds are elegant and affordable alternative of curtains and other ways of shading. Vertical blinds easily overshadow and create an atmosphere both at home and in the premises of businesses, schools and offices. 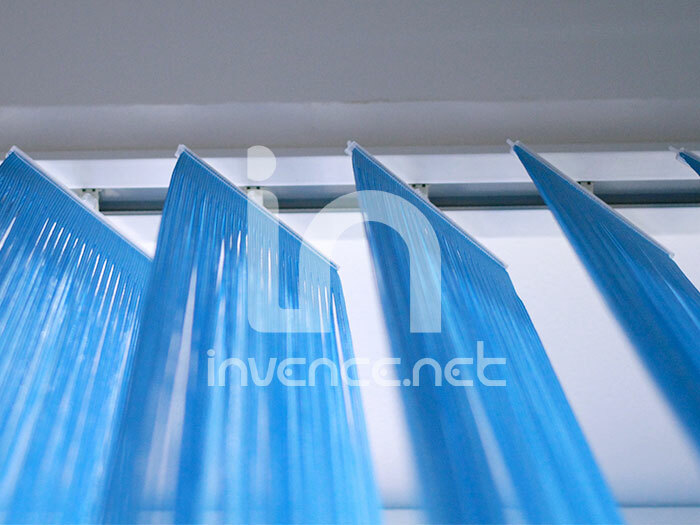 We offer the slats without bottom connecting chains. Vertical blinds can also be used as a practical divide of room. The fabric slats of vertical blinds can be combined thereby provides an effect "zebra" or "rainbow". Vertical blinds are also very space-saving. The slats create a very tight package, and so it does not neither interfere with furniture not into the window. The package of slats can be aligned left or right on both sides like a curtain. The vertical blinds are manipulated by chain, cord or a motor. See our swatches of vertical blinds here. Vertical blinds Manhattan is a variation of vertical blinds which slats are divided by horizontal, wooden or aluminum rails, which neatly divide the material into several segments. Thanks to this uniqueness Manhattan looks very luxurious. The width of the blades is in this case 250 mm. We offer many kinds of materials for vertical blinds Manhattan and a wide range of transverse wooden strips. Vertical blinds Passion are elegant and practical product easy to use. The slats of vertical blinds Passion are made from strings. You do not need to displace the blinds when you need to pass through eg. the balcony - simply go through the blinds. You can choose from 27 colors. Vertical blinds Passion are custom made according to your wishes. 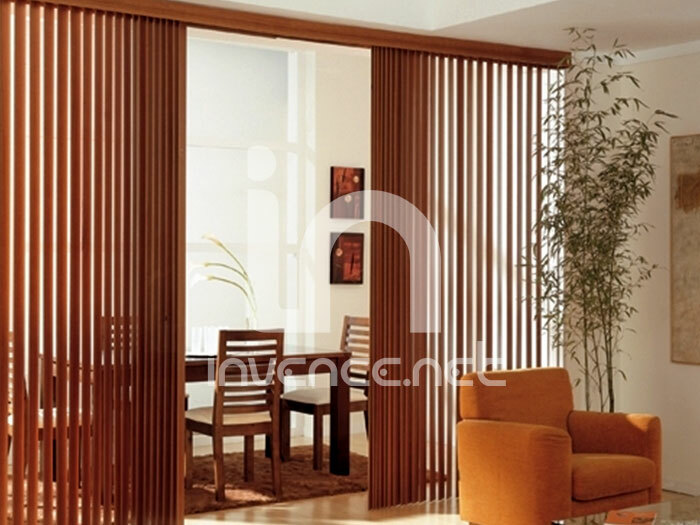 Vertical wooden blinds will surely become a luxury complement your interior. Give your home a touch of nature. You can choose from a great selection of fine woods and colors. The slats can be fitted with glazing, which highlights the wood grain or the slats can be lacquered with matt or glossy finish. The width of wooden slats is 89 mm. Maximum width of the wooden blinds can be up to 350 cm, the height 300 cm. 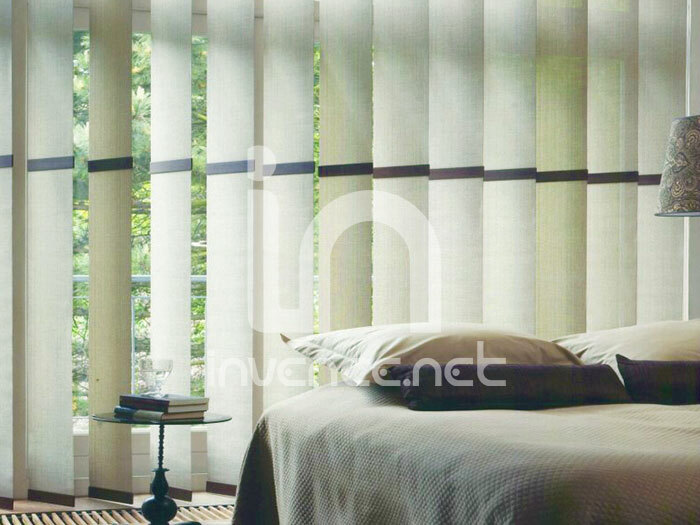 Vertical wooden blinds are tailored made according to your needs. The swatch of wooden slats can be seen in our showroom.